Around 60 kilometers southwest of Hà Nội, Perfume Pagoda is one among the largest and unique religious sites in Huong Son Commune, My Duc District, old Ha Tay (or enlarged Hanoi), right banks of Day River, northern Việt Nam. It comprises a complex of pagodas and Buddhist shrines built into the limestone cliffs of Perfume Mount (Hương Sơn), scattering alongside the mountain up to the peak. The complex’s center is right inside Huong Tich cavern (or in other words, Inside Pagoda). Huge numbers of pilgrims flock to the site during Perfume Pagoda festival, which begins in the middle of the first lunar month and lasts until the middle of the third one (or from February till March) in order to pray for happiness and prosperity in the coming year. Also, it is a very popular opportunity for young couples to meet and for numerous budding romances to be formed. On this special occasion, a wide range of traditional cultural activities is incorporated. Perfume pagoda is not only a religious site, but a great sight-seeing spot in Vietnam as well. The Perfume Pagoda, one of more than thirty peppering these hills, occupies a spectacular grotto over 50m high. The start of the journey is an hour’s ride by row-boat up a silent, flooded valley among karst hills where fishermen and farmers work their inundated fields. From where the boat drops you (memorize your boat’s number as there are hundreds of identical craft here), a stone-flagged path shaded by gnarled frangipani trees brings you to the seventeenth-century Chua Thien Chu. Coming to Huong Pagoda, what should not be left home is a good camera, since you will regret unless you catch all the snapshots of this fascinating nature drawings! 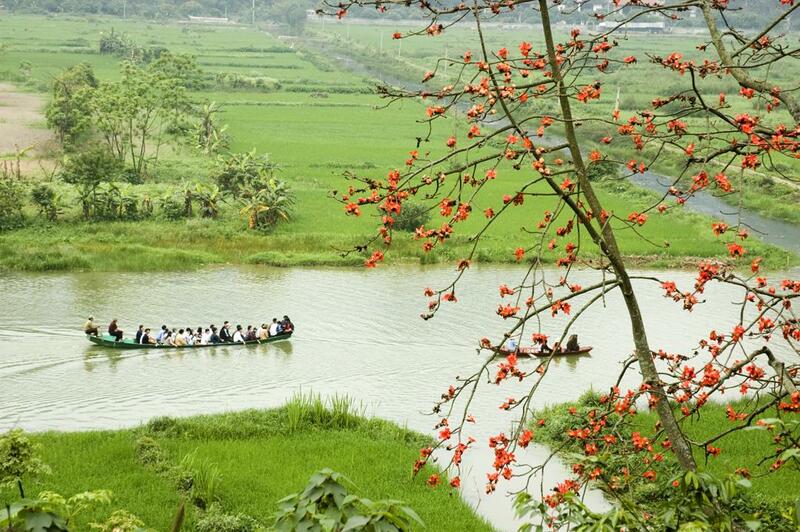 While traveling along Yen Stream, tourists pass by stunning landscape of blazing green rice paddles studded with jagged limestone mounts to the base of Huong Mountain. If you are on a boat there, you can easily see on your left the Phoenix Mountain, and Doi Cheo Mountain, which looks like an Indian python (Tran). Also on the left are Bung and Voi, the two mountains associated with interesting legends. On your right is Ngu Nhac mountain with the Trinh Temple where visitors stop and burn incense for the God of the Mountain. Before reaching Tro Wharf where the tour begins, the boat also passes by the Deo and Phong Su Mountains, Son Thuy Huu Tinh Cave, Trau Cave, Hoi Bridge, and Dau Valley. Stepping inland, there comes an interesting informal protocol for tourists! The first stop before climbing up to Huong Mount must always be a visit to Den Trinh, which means “registration shrine”. The next point of interest would be a visit to Thien Tru Pagoda (chuà Ngoài - Outer Pagoda), which was built in the 18th century under King Le Thanh Tong dynasty. “Thien Tru” means a heaven kitchen, derived from the imagination of the locals in this region, of which the rock formations in this area look like chefs busily working in the kitchen. Thien Tru Pagoda is famous for Thuy Tien tower, a granite monolith. On the right is Tien Son grotto, popular for five granite statues and various formations on the walls of the cave. Coming here, pilgrims have chances to admire the pagoda’s beauty and wonderful local landscapes. Note that the hike is hard going and can be highly treacherous on the descent during wet weather; you’ll need good walking shoes and remember to drink plenty of water, especially in the hot summer months. It’s a good idea to bring your own, or be prepared to pay above the odds at drinks stalls along the route. During festival time, the path is lined all the way with stalls selling tacky souvenirs and refreshments, giving the place more of a commercial than spiritual atmosphere. After more than one hour along the stream and visiting the initial ancient pagodas from the riverbank, now pilgrims would climb up hundreds of stone steps, and then down 120 stone steps to Huong Tich Grotto, literally meaning "traces of fragrance". 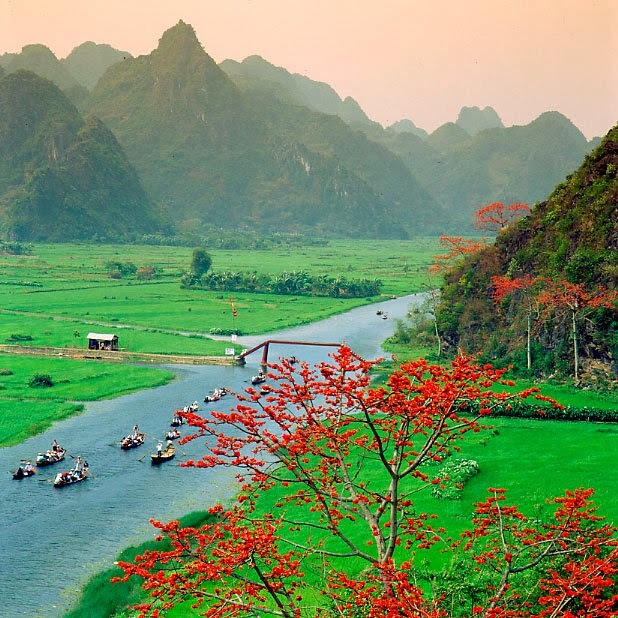 The path to Huong Tich winds its way through magnificently luxuriant landscapes. The moss-grown Huong Tich Grotto came to life thanks to the most venerable Van Thuy Thien Tran Dao Vien Quang Chan Nhan, the Chief monk of Thien Tru Pagoda. In front of the cave lie stone stairs. Stepping down the 120-step stairs, tourists will find the inscription "The first-ranking grotto under the Southern Sky" in Han scripts, which are traces of Lord Tinh Do Vuong Trinh Sam's calligraphy in the 3rd lunar month of the year of the Tiger (Canh Dan -1770). Getting into the grotto, you will find a purely cool atmosphere in a dim light before figuring out naturally architectural works such as Dun Gao (Rice) rock, gold and silver trees, Girl and Boy Mountains (in the shapes of a girl and a boy), and so forth. Yet, what is noteworthy is the statue of Avalokitesvara carved out of emerald stone on a rocky lotus, constructed in 1793, under the Tay Son dynasty, and a 1.24m bronze bell, moulded in the 3rd Thinh Duc Year (1655). The unique carving art together with the extremely magnificient works of Nature makes the Huong Pagoda complex the top-revenued tourism destination among others in Ha Tay, and the foremost destination of Buddhists in particular and tourists in general. "These days, the Vietnamese believe that Huong Son is Buddha's Heaven due to its sacredness and 100% natural works of beauty. Quite a few tourists would like to come back this mysterious and sacred mountain annually for religious reasons on the one hand, and on the other hand, for the enchanting natural landscapes".